Mr. Dan Tilton instructs CBNA FFA students in a recent chainsaw safety course on the CBNA Campus. Coe-Brown Northwood Academy FFA students Faith Wilson, Ryan Graeme, Preston Bethke, Devin Sullivan, Sam Whitehouse, Nick Jenson, Nik Mewkill, Troy Russo, Caleb Rollins, Evan Wimsatt, Wayne Libby, Jackie Joy, Molly Swansburg, Matthew Brown and Brenda Hayes recently had the opportunity to attend a chainsaw safety course at CBNA taught by Mr. Dan Tilton of Tilton Equipment, Rye, NH. 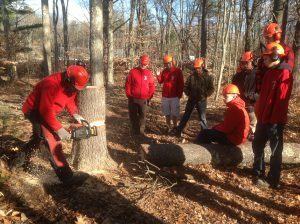 A resident of Strafford, NH, Mr. Tilton instructed students on everything they needed to know about chainsaws including correct safety equipment, how to correctly and safely hold and operate a chainsaw, and the parts of a chainsaw and the purpose for each part. He also showed students how to properly sharpen a chain and the different types of chains used for different types of logging. Part of Mr. Tilton’s instruction also included the correct way to fell and limb a tree, the way to avoid injury from a kick back from a chain saw and the way to control it when it happens.